100 PCT NON SMOKING The Hampton Inn Houston - Brookhollow hotel is located in Houston Texas off of Highway 290 at the Tidwell/Hollister exit in the center of the Northwest Business District. This hotel is convenient to all of the major freeways of Houston with easy access to downtown Houston the Houston Galleria and Uptown Shopping District Willowbrook Champions Cy-Fair and Cypress. 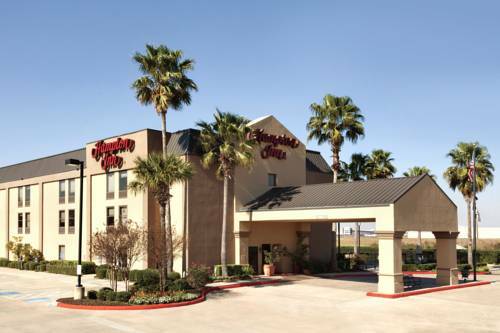 The Hampton Inn - Brookhollow is close to many of Houston*s top area attractions including the Sam Houston Race Park Houston Zoo George R. Brown Convention Center Minute Maid Park Toyota Center Reliant Arena NASA*s Johnson Space Center Kemah Boardwalk and the museum art and theater districts. Our hotel is also within walking distance of a 24-screen movie theater and several great restaurants. The Hampton Inn - Brookhollow hotel in Houston is an interior corridor hotel that features 81 tastefully decorated rooms that include five suites with whirlpool tubs microwaves and refrigerators. Additional amenities of the Hampton Inn include non-smoking floors a meeting room that accommodates 35 people valet laundry service guest laundry facilities a fitness room with all brand new equipment complimentary access to a local fitness club and a beautiful outdoor pool. Each guest room at the Hampton Inn - Brookhollow hotel include complimentary high-speed wireless Internet. voicemail data ports two phone lines in each room complimentary local and 1-800 calls hair dryers irons and ironing boards coffeemaker 25** TV*s with pay-per-view movies and games. Guests of this Brookhollow area Hampton Inn hotel will enjoy the complimentary On the House hot breakfast and the On the Run breakfast bags /available Monday-Friday/. It will be our pleasure to serve your hospitality needs here at the Hampton Inn - Brookhollow hotel in Houston Texas. all reservations must be guaranteed with major credit card regardless of time of arrival. ALL RESERVATIONS MUST BE CANCELLED 24 HOURS PRIOR HOST TIME UNLESS DEPOSIT IS REQUIRED. IF THIS RESERVATION HAS BEEN MADE ELECTRONICALLY PLEASE CANCEL IT ELECTRONICALLY TO AVOID CONFUSION AND A NO-SHOW BILL. POLICY SUBJECT TO CHANGE. - George R. Brown Convention Ctr.